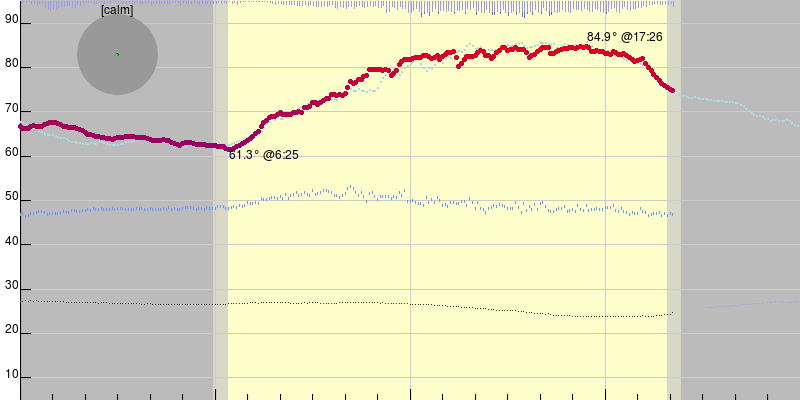 Temperature: the dark line is today's temperature, the lighter one is yesterday's. Dewpoint: the choppy blue Woodstock chatter lines indicate dewpoint in degrees F.
Wind Speed: The circle at top left is wind speed and direction over the last hour. Speed is on a linear scale: calm is at center, 12 mph is about halfway from center to circle's edge, and the edge itself is 25 mph. Bright green means recent data (last 3 minutes), darker means older data. Rain: the light blue bars at bottom indicate rainfall for that hour. Numbers above the bars are in inches. The darker dots in each bar indicate the rainfall in each 5-minute period: lots of low-down points indicate a gentle rain, fewer higher-up points a heavy rain.